Hi Azaran; presumably you have grabbed the "Warehouse B key"
either ; I presume they are merely added decoration? That also happened when I reinstalled Thief Gold for this contest. It was an issue with "motiondb.bin" in the root folder. I replaced that file with the original from the game discs and it solved the problem. Thanks , My GOG download file has an Acestream extension for some reason I'll see if can copy the file from my original TDP discs if I can find them to give that a try! About those chests in the Mages' Guild, they are indeed accessible. They are not for show. Here are two hints for them. 1.) For the left side that has a door next to it, you may want to look outside of that room for clues (next to it and above it). 2.) The one on the right is a bit tricky. Has something to do with the courtyard with the fountain in the middle of it. It's a beautiful mission!!! But as much as there were enough shadow spaces on the streets where I could hide, as less of them are in the guild. I've only 5 moss arrows and the guards see me when I'm hiding in the dark. I'm playing on Normal but find it very hard to move along in the guild. I can't get into the guard barracks nor the library for the same reasons. The tiles are loud and there's almost no place to hide from the mages and guards. I'm sorry I have to quit. Perhaps sometime it can be made a bit easier to play. What does the button do? I was able to get to the hand without pushing the button. It rotates one of the statues so you can proceed to the Hand of Fate. I have completed all of the objectives except for the first one. I have a scroll which explains how to get I to the mages' guild and I read it but objective 1 didn't complete. Is there something else I need? Oh, I have a guess as to what happened. There's a blue and green female servant that had a letter that triggers it. Since you've did everything else, you may want to check around the city to see if there's a floating scroll. Since you've completed most of the objectives, some of the AIs disappeared. I was kind of hoping that everyone would see that scroll on her left hip, but I guess it wasn't as visible as I thought it was. Thanks GORT - I had the same issue but since searching around the city I found the scroll as you suggested. I'd thought the information might be back at the Opera House where I couldn't return - so pleased to find it and was then able to finish (3195 / 3665 loot and 1/3 secrets on Expert). I am sure there is a secret by the fountain at the guild - not the stones puzzle - which appeared to partially activate at one point but I don't know why? Any hints? Certainly a tough mission - as we probably expected - with not a lot of equipment and where stealth is essential - great to see the Opera House and a warehouse feature and no undead! Clues are pretty light on where to go or what to do sometimes with a few dead-ends and I found the the high AI sensitivity pretty tough (my own fault for choosing Expert maybe) but satisfying to complete this challenging mission . Thanks GORT . Ok thanks Gort. I'll go back and look. The scroll I have now has the poem at the end. After completing most of the objectives I found a key floating which now makes sense. Edit: I found it exactly where I left the female servant. Last edited by john9818a; 3rd Jan 2019 at 14:12. Oy oy oy oy oy oy... It was really stressful mission to ghost. It took me 2,5 hours. I got also 2 secrets out of 3 (even though the stats are saying that I only got 1 secret). I remember beginning when I KO-ed 15 NPC in the first playthrough. Seeing all of them on the street was an impressive view. I had huge dilemma with guards at the front of Opera. I saw a report that somebody managed to slip through guards with just first alert, but I wasn't happy. Doing that in normal circumstances would mean that guards could notice me and immediately attack me. I felt that abusing the fact that they start as neutral NPC is wrong. Instead I decided to use servant's services. Which means that's a bust for me. I hid the bodies in the shadow in the corner. It ended with first alert from every NPC walking towards stairs. It's funny that NPC have problem with noticing me standing in the shadow near them, but if there is laying body nearby in full shadow, they immediately first alerting to it. Also a fun discovery that gas explosion is a little independent from servant. It means that servant must meet with guards first, but explosion is happening only if Garret watch it. Even if servant left this place long time ago! Now for Opera itself. Left side of Opera is very hard to pass and also completely pointless. I wasted there lots of time trying to ghost it. Right side is also very hard because of archer's random patrol combined with stationary guard. I had problem with getting to the second floor, because stationary woman was there. At first I thought she froze there and tried to rope up to the balconies, but I failed. Luckily I noticed that the woman change direction of looking. In the city the hardest part is definitely the bridge with stationary archer. Him and lots of traffic in this area means that this is hard place to ghost. Warehouse area was surprisingly easy to ghost with only 2 a little troublesome spots. First was a room with an old man and blue gem. I needed to turn off the light, then saved only to notice that old man stopped at watching outside door. I felt like cheated. I really hate these random patrols. Second problem was Hammerite getting stuck in elevator and blocking it from use. Luckily he was facing the corner of the room. It took me few minutes to figure that I can use shoot rope arrow from entrance to room onto ceiling and mantle onto second floor. That was quite a riddle. Mage Guild have lots of hard spots. I noticed that if you get spotted once then immediately appears that you got noticed the second time as well. I don't think it should work that way. I used 4 moss arrows in the area with stationary mage guarding 4 chests area. Also I think it's weird to use quiet floor that looks like noisy floor in the area of 4 chests. And I wonder if NPC can notice me through wall which is invisible. Another huge problem was quest with Rogue Mage. It is optional and it involve knockout. Also I didn't know if I manage to transport unconscious body without getting spotted by the guard patrolling Guards Room area. I can barely do that without body, so I don't think it's possible to do it with a body. That's why I have decided to not trigger this objective. But I needed to get Golden Skull in front of Rogue Mage, so I decided to push him forward. And I noticed a problem - he's moving diagonally into statues on the right. That was quite a problem. Luckily I figured out that I can mantle on table and then jump on metal railing. Thanks to that I pushed him back onto path between statues and in much faster pace than on the ground. I got Golden Skull. I was really proud from my solution. Escape part was easy and I beat this mission. Now that I think, I wonder if teleported unconscious bodies of guards can be spotted by other teleported NPC. That would be another bust then. But I can't check that, because there is no body count stat for this mission. 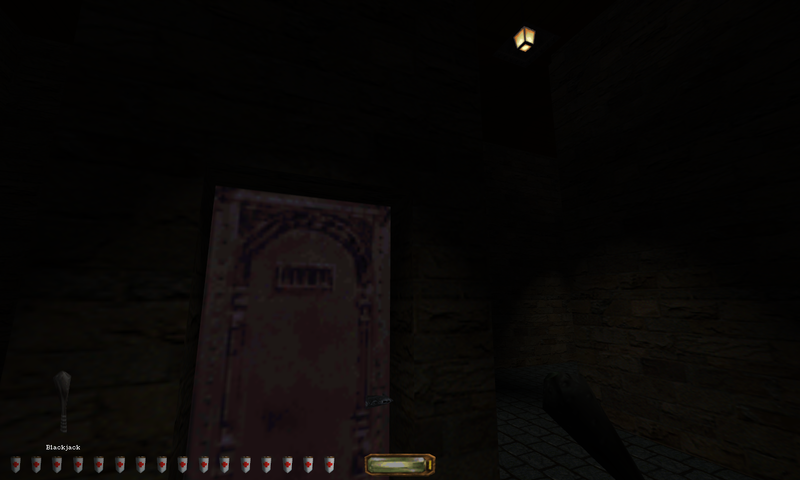 I know this doesn't particularly pertain to only this mission, but I've noticed that AI can see ko bodies in dark shadows even from far away in New Dark for Thief Gold. It's been ages since I've played a mission, and this one is probably not the easiest starter. I have only found the opera house, not the warehouse or the guild. I have an odd poker, and have been running all over the place looking for a place to use it, but no luck. Thank goodness there are no tiny switches to find here, as I apparently can't even find entire buildings! Are you having the same problem with OMs and/or other FMs? Hmmm... I think I'll go for the little stuff first. 2.) Also, is your installment of Thief Gold in English or German? Whatever that means, language setup is messed up. Check install.cfg for the language settings. inside the install.cfg it's set to german "language german". If that was what you meant. It is weekend again and so I could finally continue this mission. Very well done! - the teleportation trap in front of the opera house after retreiving the mages guild bracelet from the odd poker - a clever way to hide the mages guild. - the warehouse storage key was very well hidden on a place I didn´t expect it at all. Difficulty overall was very high, it took me some time to navigate through the crowded opera house and the mages guild. Getting inside the opera house required to be on a certain place on the right time. I noticed afterwards I had the option to use the gas mine instead. So the concept was pretty well thought out if the player missed a certain event. Due to the very high difficulty I would not recommend it for the new players out there. But what else can we expect from an author well known for the sheer hardness in his missions? Overall I would give this mission a 9,5/10 rating, it had a very solid gameplay and an excellent story. The only confusing aspect in gameplay is that is not enough to bring the rogue mage in the sleeping quarters, he needed to be put on his bunk bed. Afterwards the objective will tick off. Also the time window for triggering the event in front of the opera house seems to be very narrow. Right now I practically finished the mission with something over 3.000 in loot, but I want to find the last two secrets (chest next to door in the statue room and how to open the big double door next to the fountain in the garden). I already figured out it has to do something with the ground plates, because I opened the double door shortly by accident but now I can´t reproduce it. Is there a hint somewhere in the guild? I need a spoiler please! Last edited by Thinking Robot; 5th Jan 2019 at 10:46.